PURPOSE: The Sunshine Program at Clarity Hospice has one of the only pediatric programs that serves the Baton Rouge and surrounding areas. Our children are limited in this state when it comes to resources revolving around end of life care. We are opening doors for these children and their families with this new program. We need your help to help these children. We have developed a foundation called The Palliative Care Foundation of Baton Rouge. The foundation was setup to provide assistance to those that are affected by a life-limiting illness. It is the purpose of Casting for Kids fundraiser to raise money to help children and those affected by a life limiting illness. All the money that is raised will go to help fund any burial services, medical equipment, medications, supplies and/or any other medical care that insurance will not cover or the family cannot afford. Donations may also go towards toys, books, educational videos, granting a child’s last wish, summer camps, or even a last family vacation that maybe the family could not have done on their own. Our goal and mission is to never turn a child away because of their inability to pay. RELEASE OF LIABILITY AND COVENANT NOT TO SUE: A wavier, release of liability, and covenant not to sue is part of the entry form. It is required that all contestants take responsibility for themselves while participating in event activities. ENTRY FEES: Kayak & Boat Division entry is $45 minimum donation and Kids Division entry is $20 all division entries includes a t-shirt as well as post tournament meal. (Extra shirts can be purchased for $15 each). If ordering any additional shirt please include the appropriate extra amount ($15 each) and the sizes desired. PRE-REGISTRATION: Pre-Registration will run through July 1, 2015. You may still register until July 17, 2015 at 9:00 pm, but to guarantee a t-shirt for yourself you must pre-register by the date above. POWER BOATS & PADDLE-CRAFTS ALLOWED: Any power boat is allowed. Paddle-crafts with trolling motors and sails are allowed. (NO “mother ships”) You must stay in your boat or kayak at all times while fishing. 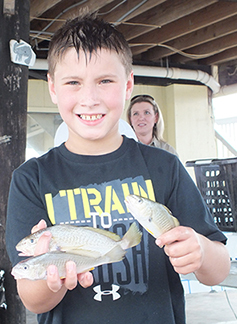 Kid’s Division participants are open to fishing from any watercraft, bank or pier. LEGAL TACKLE/BAIT: Any hook and line combination is allowed. LEGAL FISHING TIME/ BOUNDARIES: You may make your first cast at 5:00am. Weigh-in will begin at 2:00pm but you must be in line for weigh-in NO LATER than 4:00pm. All anglers must have an up to date fishing license for saltwater. 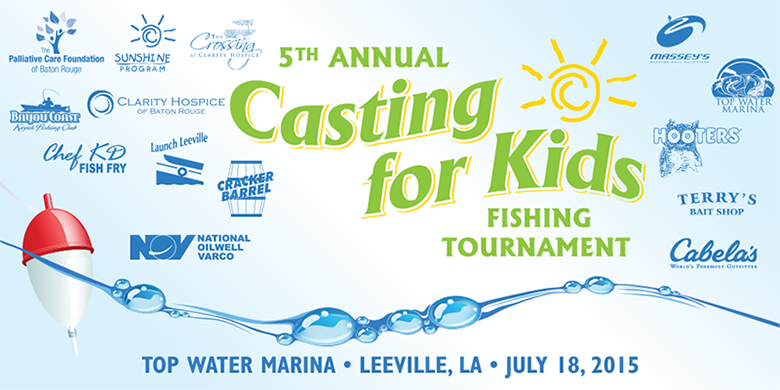 All fish must be caught in accordance with LA state law and the following tournament rules. Any waters south of the town of Cut Off in either Jefferson Parish or Lafourche Parish are eligible. SIGN IN/WEIGH IN: The sign in/weigh in station will be operational starting at 2:00pm, and will run till all anglers have signed in by the 4:00pm deadline. Any angler signed in at the weigh-in at Top Water Marina by the 4:00pm cutoff time on July 18, 2015 will have the option to weigh their fish. Any entrant that does not make the 4:00pm sign-in cut off, will not be allowed to weigh their catch and will not qualify for any fishing awards. There will be no exceptions to this rule. Official time will be kept by the Tournament Directors at the weigh-in stations. Anglers are strongly urged NOT to wait until the last minute to sign-in to submit their catch for weigh-in. Weigh-in time is the tie breaker. All competitors must check in with legal fish (LAW&F Regulations) to be eligible for fishing prizes. All fish submitted must be caught on the day of the tournament. The weigh master will make decisions an accepting fish for weigh-in, their decision is final. Any attempt to enter fraudulent catch, exchanging catches, tamper with catch, or to hamper or threaten any official of the tournament will result in immediate disqualification. Only authorized persons will be allowed in the stations. You will receive a token when you check in at the sign in table; your catch will be weighed in the order according to you token. The largest fish will be determined by weight. In the event of a tie, the first fish entered will be considered the winner, and the other will be dropped to the next position. (Redfish will be bent, and loosened straight before being measured with a pinched tail to ensure they are not 27” or longer.) When your token number is called entrant should weigh all fish at that time. You do not have to weigh different fish for different categories. Our software will keep you in the highest placing category and drop your lowest. First through third place will be awarded. Cajun Slam: Heaviest 3 fish stringer wins. 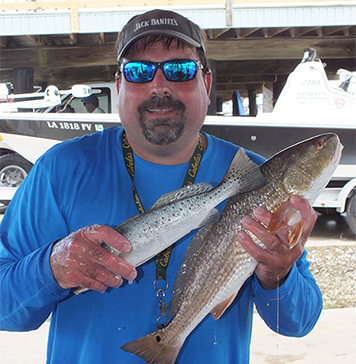 Slot Redfish: Heaviest slot length redfish wins (16”-27”). Mule Trout: Heaviest speckled trout over 12” wins. First through second place will be awarded. Trash Fish: Heaviest fish over 12” wins. Note: You are only eligible to place in ONE category. You may weigh fish for two different categories but you must do so with different fish. If you were to place in two categories, we’ll keep your highest ranking category and the other one will drop and go to the next contestant in line. You are responsible for deciding which category/categories you want to enter and which fish will go to which category before you get to the weigh master. If you have any questions please contact: Janet Rhodus 225.413.4414 janetrhodus@hotmail.com.